Florida’s Republican nominee for governor is using a group formed to protest the fatal shooting of unarmed black teenager Trayvon Martin by a neighborhood watch volunteer to portray his opponent as anti-police, anti-Israel and anti-American. 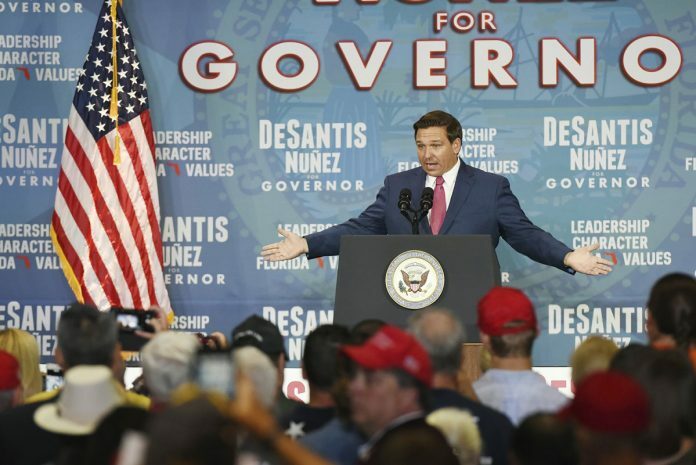 Former U.S. Rep. Ron DeSantis is focusing on a Dream Defenders pledge Democratic Tallahassee Mayor Andrew Gillum signed promising not to take campaign donations from private prisons or the National Rifle Association to cast him as an extreme radical. The pledge also expresses the intent to shift resources away from “prisons, detention centers, guns and police” and toward programs that support the safety and basic needs of the people. The group has a clear far-left agenda but not so extreme that Democrats distance themselves. It co-hosted a debate with four Democratic candidates for governor in June, and Gillum and the other three candidates signed its pledge. Dream Defenders formed to bring attention to what it sees as inequality in the justice system — protesting George Zimmerman’s shooting of Martin and staging a 31-day sit-in at the state Capitol after Zimmerman was acquitted of a murder charge. DeSantis and other Republicans are using its positions on the justice system as well as its critique of Israel to criticize Gillum, who maintains he shouldn’t be judged by everything the group says. DeSantis’ comments about Dream Defenders were the latest racially charged incidents since Gillum and DeSantis won their parties’ nominations Aug. 28. Gillum is hoping to become Florida’s first black governor and has questioned DeSantis’ association with people seen as racially divisive. Just before DeSantis’ comments on Dream Defenders, Gillum reminded debate watchers that DeSantis said voters shouldn’t “monkey this up” by electing Gillum, a neo-Nazi group made robocalls featuring jungle music and monkey screeches that mocked Gillum, and President Donald Trump, who endorsed DeSantis, didn’t take a strong stance against white supremacists after a protest in Charlottesville, North Carolina. “You want to talk about division? It doesn’t get more divisive than the Dream Defenders,” DeSantis shot back. Although made up largely of African-Americans, Dream Defenders membership includes other minorities and whites. Since the Capitol protest, the group has sought to become politically influential and has been engaging politicians. She added that she isn’t entirely surprised that DeSantis is trying to make their supporters afraid of a group that’s standing up for black Floridians. “He’s got a very old playbook — pointing out young people of color and making them seem radical,” Summers said.